500N is a valve actuator for three-way valves. • A black body structure. • An LED-indicator and gear unit. • A transparent body cover. • A manual crank for adjustment. • Plastic parts are self-extinguishing. • Electronic force dependent disconnection. 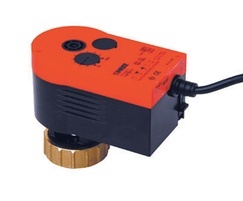 • Automatic adjustment valve lift. The gear body and mounting handle are made from cast zinc.